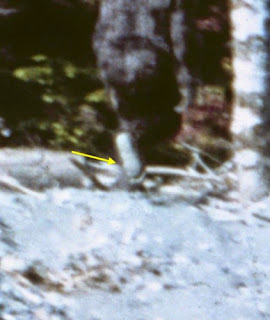 On the 20th of October, 1967, Roger Patterson and Bob Gimlin filmed what many still hold as the best Sasquatch footage ever. But has it stood the test of time? 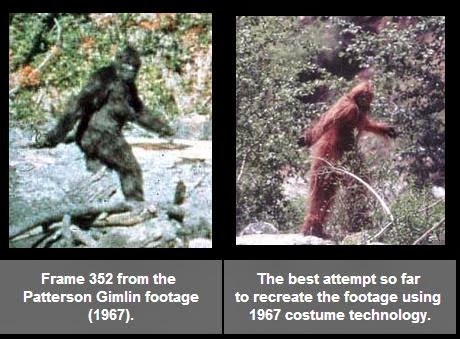 By celebrating the 50th Anniversary of the (in)famous and enigmatic Patterson-Gimlin film let us have a well deserved fresh look at it. The original video sequence from Bluff Creek, CA; as you can see, it's only in the last seconds of the footage the biped shows up. At a first glance it looks convincing, but the shaky camera and lacking level of detail make it hard to be sure. Thankfully, digital manipulation is out of the question, thus leaving us with two possible explanations: we see a human in a suit or a genuine phenomenon not yet acknowledged or understood by our scientific institutions. For a long time film analyst M.K.Davis enhances and stabilizes parts of the footage. The sequences he posts play a key role in this article, and ultimately in understanding the nature of this particular documentation. His continuing work can be found on his photo journal: The Davis Report. 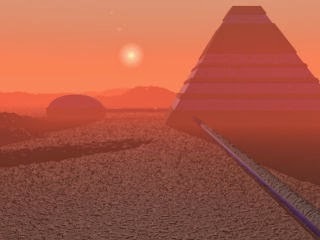 In this first example [link] the main footage has been stabilized with added frames, giving us a much more crystalline look on the object of interest. Even though it gives the impression of being huge, it moves smoothly, almost mechanically forward. One might notice the peculiar gait and the abnormally long arms reaching down to it's knees. We can also see it has a pair of female breasts. If it is a suit one have to wonder why the hoaxer bothered with those, considering it must have been an unnecessary detail on an already extremely complex costume. As mentioned the size seems significant. Thanks to a few detailed renderings made by Davis (based upon comparison photos from 1968 by John Green), we can get a pretty fair estimate. The man in the picture is said to be 195 cm tall in his boots. Supposing the comparison is accurate, the suit must have been of a considerable size, worn by someone with the stature of André the Giant. [link]. The picture above highlights the arm length ratio compared to a human. In the footage the knuckles reaches down to the kneecaps, now for this to be possible the suit must've had arm extensions; however, the arm straightens out as the head turns to look into the camera - a feat human anatomy won't allow. Moving along; in these three excerpts the movement of the back and buttocks shows remarkable detail. One might also notice the toes on the right foot. The gait is crucial. Many have pointed out that the way the entity walks not only is unnatural for a human being, but that it is straight down impossible for us to mimic. Thanks to the YouTube account ThinkerThunker we have a short but highly qualitative video outlining the anomalous aspects of it. 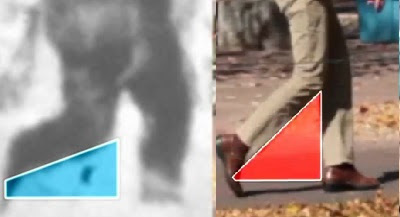 The 2 minute video analysis brings attention to the fact that the biped never fully extends its legs, and that the shin rise is way steeper than a humans. The picture is a screenshot from it. to replicate the walk can be seen here. 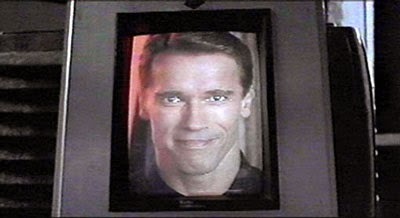 Imagine if one replicated the walk motion somewhat accurately. It would have to be in a huge monkey suit (with breasts), and be made to look completely natural, in order for it to be legit. There has been numeral people calling the footage into question. Some attempts have even been made to recreate the sequence with manufactured costumes. The most elaborate try was made by BBC in the late 90's. In an episode of X-Creatures a film team hires one of the best costume makers in Hollywood to help them recreate the happening in 1967. This still picture comparison sums up the result. 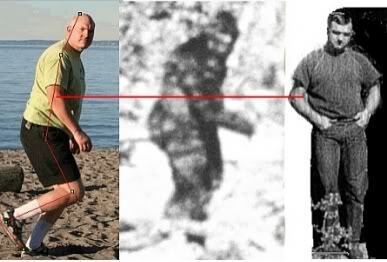 Even after obviously failing, they concluded that their attempt effectively debunked the PG-film (and therefore the whole Sasquatch phenomenon). This irrational way of presenting information must at best be confusing for the viewer, not to mention insulting. For an in-depth look at this particular case I recommend this article on BFRO.net. No attempts with a bigger budget than BBC's have been made. Thanks to shows like BBC's X-Creature et al. there's a wide spread "fact" that the Patterson Gimlin-footage is a hoax, but just as is the case with other mysterious phenomenon there's a lot more to it, than meets the eye of the official stand point. In this case we do not only lack a suit, but we are seemingly unable to recreate one, even 30 years later. How one would go about to move around convincingly in such a creation is a problem we can't explore; so far we only know that no one has managed to do it without one. Seeing as the man-in-a-suit argument is such an unsubstantiated explanation, the logical mind would have to at least, for the time being, accept the alternative explanation as being a distinct possibility: Perhaps Roger Patterson and Bob Gimlin were telling the truth all along.